Sen. Marco Rubio is maintaining a blistering campaign pace, concluding a fourth rally in the state of Virginia last night in Salem, Virginia, in front of a huge crowd of supporters. But he wasn’t finished insulting Donald Trump, mocking the size of his hands — and alluding to the size of his manhood. 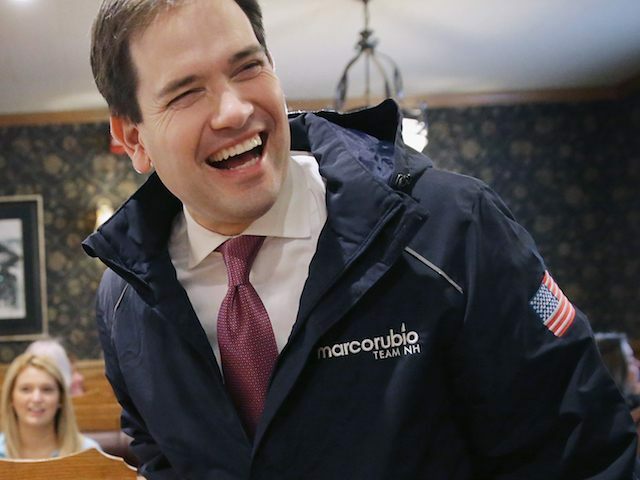 Rubio’s voice had gone hoarse after a big day of campaigning, but he earnestly continued. He also again mocked Trump’s spray tan. In Virginia Beach, Rubio taunted Trump for vowing to end job outsourcing in America. He warned that Trump was dangerous to the conservative movement, who would lose to Hillary Clinton if nominated for president. “I’m telling you, if we nominate Donald Trump, who today is the frontrunner, we will lose this election to Hillary Clinton,” he said. In Purcellville, Virginia, Rubio brought up a controversial interview Trump had earlier in the day on CNN. On the Sunday morning shows, Rubio ridiculed Donald Trump’s history of business failures. He continued the attack that he began in the debate on “Trump University,” reminding voters of the “con job” that he was playing on the Republican party. “This is part of the clown act. This is what happens when someone is caught, like Donald Trump has been, as a con artist,” he said on Fox News Sunday. On Saturday, Rubio mocked Trump’s face during a campaign rally in Georgia. He also alluded that Trump was a dangerous dictator, unfit for the White House. “There is a lunatic in North Korea trying to get a nuclear weapon and a lunatic trying to get ahold of nuclear weapons in America,” he said. Although Rubio appeared to enjoy the attacks, he apologized to some audiences for stooping to Trump’s level. “I’ve used strong words and my parents didn’t raise me that way, but I’ve used strong words because I feel that passionately about it,” Rubio said, during the Yellowhammer News Presidential Forum in Homewood, Alabama.